She does. When she’s sick she reads Grimm’s fairy tales. In Ezekiel 16 she reads a grim fairy tale, and it is by far her favourite. She philosophizes about fairy tales, she writes them, she loves them. And furthermore, she doesn’t care if people think it’s silly, because she knows in her head and her heart and all her being that it’s not. You don’t think something’s silly that you believe in. Look, it’s not just Cinderella or Snow White. It’s what they mean. She knows that they mean something far greater than happy endings, than dancing princesses and wicked old hags. For her they represent more serious plights in the world today, each one of them. They represent things in this world and out of it, transcendent. She lives a fairy tale. The truth about fairy tales is this. Faeries do not fly around on feathery wings. The truth about fairy tales is this. Some have sad endings. Fairy tales aren’t always the fluffy animated Disney characters whose likenesses you can purchase at your local Wal-Mart. In the original Cinderella story, Cinderella’s sisters had to cut parts of their feet off to fit into the glass slipper, and it was by the blood dripping on the road to the palace that they were betrayed. There is beauty in these tales, and there is terrible grief and much to instruct her. To quote her dearly beloved Chesterton on the matter… he says that fairy tales don’t prove that dragons exist, but that dragons can be beaten. I have a visa in my possession, I have a plane ticket, a few clothes, one book, and two weeks left in America. The adventure? Siena, Italy, in the heart of Tuscany. I took this picture on my last trip to Italy. When I clicked down on the button, exclaiming again and again because of the sudden, unexpected beauty, I had no idea that just two months later this would be my home for four months. A few hours later, the opportunity was presented to me and I said, “I’ll look into it,” and to myself I said, “What a joke.” I applied to the Siena Art Institute, I was accepted with a full tuition scholarship. 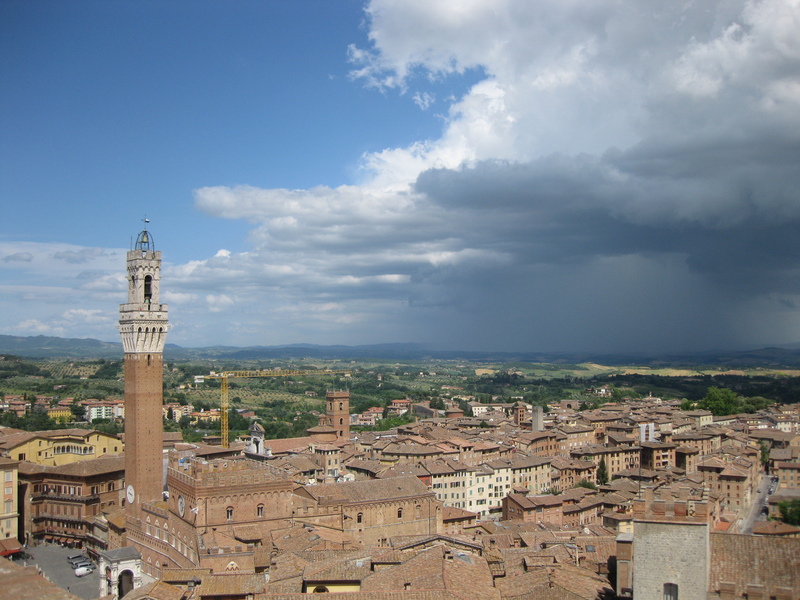 In two weeks I’m leaving to live with an Italian family and to study creative writing in this historically rich town. I haven’t latched onto reality yet, even in the midst of working hard every day to make this happen. And I’m terrified, really. I’m terrified to be so disconnected from my home. I’m terrified of that loneliness. But I also believe that the fear can be conquered. And my mind is open. My desire is to learn. In this opportunity God has blessed me exceedingly. My desire was never to attend a university for four years. Rather, I wanted to study in areas I was gifted in, specifically creative writing. My desire was to learn, to be competent in what I want to spend the rest of my life doing—writing. I want to write to change the way people think, and I don’t—don’t—don’t want to write Christian fiction. (My hero is Wendell Berry.) I had no idea that I could study outside of a university—especially overseas. I didn’t even look into the idea because I thought it was impossible—even though it was exactly what I wanted to do. Now I have to ask for your prayers. I’m going to a strange place, away from fellowship that has been soul-strengthening. I am going to a place that is prominently Atheistic and then Catholic. I am praying that I won’t be alone and that I will find some other Christians to fellowship with. Pray that my mind will be open and I will learn many things from this trip. Pray that I remember to blog. Pray that God gives me strength to be stalwart in my faith, and that he will sustain me throughout these four months. Pray that he will prepare me for whatever lies ahead, since I don’t know what to expect. I am excited. I am sad to leave my home, sad to leave many people I love, but I know that God is working through me, and I can’t wait to see where he is taking me in all of this. I believe in fairy tales. I am living one. And so, I believe that this is an adventure, absolutely worth taking and worth enjoying. And I give all the glory to God for everything in my life, for the suffering and the joy and the contentment and the peace. He’s working through me and sanctifying me, and all of it is for his glory. Praise the Lord. Not loving all you see? There are some songs, like this one, that just hit a spot in you. I can’t explain why they do this, but they slap you in the face, and they make you think: “There’s a lot of people in this world who have less and have lost more than I have. What can I give to them?” Because even if you run out of physical, tangible things to give away, there are always gifts in your mind and your heart, if you have taken care to become that kind of a person. And you realize soon that nothing is about you, that there is a tie you have to other human beings, an inborn ability to help them, to become their brother and sister, so that if we had a correct picture, you would see the whole of humanity stumbling up a mountain, and every person would be holding someone else’s hand, or pausing to bind up each other’s feet. Idealistically. But I have to interrupt my own thought, and I have to put it to rest, and realize that before we can paint that picture, we must have the model. Unlike a mirror, which falsifies its object by showing the exact opposite of what it sees and makes you believe it’s not, the artist would paint exactly what he saw, exactly what was there, with no pretending on the part of the subjects. The problem with dreamers is that we tend to dream of the results instead of how we get to them. Because we are not naturally good. When I see a person who looks absolutely perfect, I remind myself: “Well, I bet they pulled their sister’s hair and scratched their brother when they were two. Those sinners!” And then I laugh. And then I blush, maybe, because I realized that I did that, and then I want to go hide so no one can see me because I think that they can see all my memories of all the horrible things I’ve done. But a line from a Muse song comes to mind: “I choose to hide from the All-Seeing Eye.” And I shrug my shoulders, thank God for his mercy and forgiveness, and trudge on. I think the greatest lie in humanity is the lie that people tell themselves when they say: “I am alone.” And the lie that says you were meant to be alone. If only we were not deaf, we could hear each other’s voices, we could hear the birds, the wind, and we would realize that there is something out there, and then we would reach out our hands and still not feel anything, except a sense of fullness and satisfaction. For when you open your heart, you open it to a great danger, and that danger is that something might enter it, and when something enters it, everything you know, your whole life, all your plans, become the bits and pieces of a smashed monument: for when your heart is open, you no longer have the heart to live for yourself. Songs like this make me want to create. They make me want to capture a quiet moment, a meaningful moment, and show it to the whole world. They make me want to catch images in my mind, and plaster them to the walls of my mind so that the force of their meaning will always be with me, staring me in the face wherever I go, and I will remember most of all that picture of humanity climbing the hill. I have been thinking about the word wait, and I love that word. It is everything I would wish to be. Wait quietly. Wait patiently. Wait slowly. Wait. Wait. Wait. I tell myself to be gracious, to be kind. I tell myself to wait. To not rush my words. To think before I speak. To pray before I plan. To plan before I take action. I tell myself to think quietly. I tell myself to wait, and be wise. I tell myself to wait until the time is right, and then seize the day. I tell myself that my time is short. And I ask myself what I will do with that time. My capability is low. My strength is weak. Strive for perfection, settle for excellence, a friend told me. Festina Lente – Make haste slowly. I think of the nuns in the Sound of Music, slowly walking to answer the bell at the gate. I think of Treebeard – “Don’t be hasty!” I think of God, who has been patient with me, and I yearn for the time when I will be perfected. Work and wait, I tell myself. Be productive, and wait. Be kind, and wait. Banana Pancakes. It’s a sweet song by Jack Johnson, and I like to listen to it while I do the dishes because sometimes it makes me happy. I never really think much of songs like these. To me they’re mindless. I listen to them when I’m not really listening, not thinking about what they’re saying. Sometimes I like to give my full attention to music, let myself feel it swell inside of me, abandon myself to it, and I listen to something deeper and richer. But those times are not when I’m doing the dishes. So I was thankful when, this time, in the midst of scrubbing and rinsing and humming along, I looked up, and became struck by a sudden thought. I knew all the words to Banana Pancakes, but had never thought of them, and this line hit me. I don’t care what it means in the context of the song, but I thought about what it means right now. How often do we have everything we need, and actually consider it enough? No, whatever we obtain is never enough. As one millionaire said in response to the question, “How much money is enough?” “Just a little bit more.” Alway more, more, more, because our minds are never dead. We are brimming with ideas. We yearn and pine for things we want, and we get them. And we weary of them, just as we weary of this world, our friends, and our lives. And why? Because we have made everything worthless in an attempt to please ourselves. There has always been satisfaction in contentment, but contentment isn’t an abandonment of dreams and aspirations. But why does ambition always have the accompanying ideas of hardness, of money, of endless wealth? Why must our dreams be so contained? So pent up as to deal only with this earth and what it can give us? Why can’t we dream of what we can give other people? If we dreamed of helping other people, if our ambition was not to obtain money, but to obtain ideas, to learn how to be gracious and compassionate, to learn how to serve people best with the talents we have been blessed with, then there is contentment in that, and there is satisfaction, because that is doing the right thing. That is using ourselves as we were meant to be used, that is, not for ourselves but for the community we live in. That is why we have everything we need, and that is why it is enough. You have your talents within you. You cannot wait to hone them to use them. Remember that life is a journey, and you learn along the way. It is the blessed thing about growing older, is that if you try hard enough, you grow wiser. Don’t think you have to go to school or on a missions trip or see the whole world to minister to it in the proper way. Use what you have right now, inside of you, and let it flow out of you into the world to those you love. Strive for perfect, settle for excellence, a friend told me. That is what will bring you satisfaction, and contentment, even if you have to work harder for it than you’ve ever worked before. This world is tiresome, but we can have joy in it. These things, contentment and satisfaction, are what give us the joy to make it through the world. People are wonderful things, you know. They draw us away from ourselves, they challenge us, hurt us, love us, teach us, bear with us. There are so many wonderful things about life that we miss when we draw the curtains of our soul, and put a wall between ourselves and the people around us. But we must be self-sacrificial to have joy. You could say that joy is an acquired taste. True joy is, anyway, because it’s not what most people desire once they see all it takes to attain it. They would rather settle for something less that brings a more passionate happiness… that sadly ends too soon. They know it ends soon, they do know it, but they continue wandering this tiresome world in search of a new pleasure, trying to fill up their souls, trying to find contentment and knowing all along it will never be real, but skeptical about how to make it real. Work for joy by being content and being satisfied. Don’t try to minister to the whole world at once, but use your gifts to the best of your ability towards they people you come into contact with. Give yourself, your work, and your ambition to the community, give all of that and your soul to God. Abandon yourself to anything but yourself. Don’t look within, but without your own self. Live for God, and in doing so you will live for each other. If you do this, everything you need will finally be enough.